Motörhead. Formed by bassist/vocalist Lemmy in 1975, after he’d been kicked out of Hawkwind for allegedly doing the wrong type of drugs. So, he brought in drummer Lucas Fox and ex-Pink Fairies guitarist Larry Wallis to realise his vision of playing the planet’s dirtiest rock’n’roll. A deal with United Artists led to the recording of an album in 1975. But the label was so unimpressed with the results that they shelved the record, only releasing it in 1979 as On Parole. By this time, Lucas and Larry had been replaced by Phil ‘Philthy Animal’ Taylor and ‘Fast’ Eddie Clarke respectively. 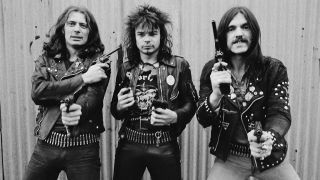 But such was the lack of interest in Motörhead, the band were ready to quit, until Chiswick Records offered them three days’ studio time to do a farewell single. Amazingly, the trio did an entire album in that period, and the subsequent self-titled release did well enough to suggest there was a future for the band. The band decided to work with producer Jimmy Miller on the album. An inspired choice? Well, up to a point. Jimmy was a recovering drug addict, and his problems with heroin in particular would come back to haunt the band when they subsequently renewed their working relationship for the Bomber album. But on Overkill, he was focused and positive. Jimmy died in 1994 at the age of 52 from liver failure, brought on through years of substance abuse. Motörhead spent a six-week period from December 1978 to January 1979 in two studios, these being Roundhouse (where much of the recording was done) and Sound Development, both in London. It was also an advantage that much of the material for the record had already been tested on the road; they’d been playing some of the songs for a while. The Metropolis song itself almost stands apart from the rest of Overkill, because it was written in haste, as the band tried to fill up space on the record. “To be honest, we were one song short. So I had to come up with something literally overnight, I remember going to a cinema in Portobello Road (West London) that night; they were screening the classic Metropolis silent film from the 1920s [released in 1927], which was directed by Fritz Lange. That gave me the creative boost I needed. So, I went home, wrote the song, took it into the studio and we did it on the spot. The other interesting track here, from a production viewpoint is Tear Ya Down – what appears on Overkill is the original version done with Neil Richmond for the B-side of the Louie Louie single. So, why didn’t the band re-cut this with Jimmy? All of the tracks on the record were written by the band, apart from Damage Case, where Mick Farren (an old friend of Lemmy) helped out on the lyrics. Now, some of the song titles here suggest weird and interesting stories – the sort that co-habit in sleazy bars and perverse alleys. For instance, there’s I’ll Be Your Sister – surely, this must be based on a very strange acquaintance from Lemmy’s past? Erm, well… that’s not the way the man himself recalls it. Much of what’s been said so far might suggest there was a certain chaotic logic about the whole Overkill process. However, things were a little more disciplined than might appear to be the case. Overkill was released in March 1979, complete with a striking cover from artists Joe Petagno, the man who created the famed Motörhead logo. Yet he wasn’t satisfied with his work on the project. Motörhead expanded their growing fanbase with this album. It reached number 24 in the UK charts, which, at the time, was a major breakthrough for the band. This was helped by the label’s cunning decision to release a green vinyl edition of the record just three weeks after it had first been issued in normal black vinyl, thereby ensuring that diehards would buy two copies. However, marketing tricks weren’t needed to convince people that Motörhead had come of age. If its eponymous predecessor had been hastily, spontaneously concocted, then Overkill showcased a band growing on every level. This wasn’t just a rabble trying to play louder than anyone else, but three fine musicians proud of their craft. Now, it’s rightly regarded as a classic.